Night Out Limo Service for a night that you will remember. Experience beautiful nightlife of Minneapolis or St. Paul,is always a great time! Whether you are with friends or family, you can be rest assured you will have a great time with 1st Class Transportation! If you have a pub, bar, or restaurant already picked out, we will be there to ensure you get to have all the fun you want, without the stress of driving through the cities. The cities at night can be hard to navigate, hard to find parking and congestion during peak bar hours can cause you to miss out on that special night on the town. If your going with a group, we recommend either using our limo service or our party bus rental service. Both of these options are great to achieve an amazing night out. Hiring an executive limo company for a night on the town is a special occasion, and 1st Class Transportation understands that. We make sure each customer is satisfied. Whether you go to just a couple bars, or go bar hopping all through the downtown area of either St. Paul or Minneapolis. Safety: Consuming alcohol and having safe, comfortable and reliable transportation back to your destination ensures that no mistakes will be made that night. Everyone can have a great night out on the town without worrying about how much they consumed that night. Affordable: Our rates are among the lowest in Minnesota! 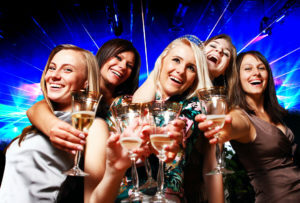 You can have a great night out on the town for lower than what our competitors would charge. 1st Class Customer Service: We take pride in our work and it shows with each and every customer we serve. Use 1st Class Transportation as your night out on the town transportation company. Whether you are looking for an SUV or a full sized party bus, we got you covered. Click book now below to start planning your night on the town! Not seeing what your looked for?